Friday night found the Norris CIty-Omaha-Enfield Junior Cardinals traveling to Ina to take part in the first round of the SIJHSAA Class M State Tournament at Rend Lake College. This first round matchup pitted the Junior Cardinals against the Grant Yankees. Grant, a Fairview Heights school, brought forth a 14-9 record, along with a center who was every bit of 6’3”. NCOE would not only find themselves under the weather on this opening night game, but undersized as well. This, however, did not deter the Junior Cardinals one bit as they quickly found themselves the recipients of the opening tip. This allowed the Junior Cardinals to take the early 3-0 lead, following a three point shot by Cord Tucker. Grant would answer back with a basket of their own, but another three point shot, this time by Preston Long, would find NCOE leading by four points. For the remainder of the first quarter, it appeared both teams would trade baskets for the most part, but a last second three from the corner by Tucker lifted NCOE to the 14-8 lead following the first quarter of play. Second quarter action was much more intense, and the Yankees managed to outscore the Junior Cardinals 12-10 to narrow the lead to just four points, 24-20, as the Junior Cardinals 12-10 to narrow the lead to just four points, 24-20, as halftime arrived. When play resumed in the third quarter, the Yankees kept using their size advantage as a weapon as they would manage to once again top the Junior Cardinals 13-10 to cut the NCOE lead to just one point, 34-33, heading into the fourth and final frame of action. 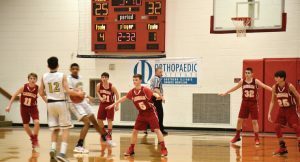 This fourth and final quarter was full of excitement as the Jr. Cards kept driving to the basket, which in turn, placed Grant into severe foul trouble. As they seem to always do, the Junior Cardinals came through at the charity stripe. This would help extend their lead back out as they went on to capture the 49-40 opening round victory. Preston Long led the scoring for the Junior Cardinals, with 24 points (18 of these coming in the second half of play.) Cord Tucker followed Long with 15 points, all of which were behind the arc in the first half of play. Others scoring in the hard fought contest were Joel Hortin six points, Erik Healy two points, and Jaden Simmons two points. Long and Hortin led the assist category with three apiece, followed by Simmons, Tucker, and Healy with two each, and one from Colby Prather. Both Preston Long and Joel Hortin would top the team with seven rebounds apiece, followed by Cord Tucker with two, and one each for Erik Healy and Jaden Simmons. Leading the way in steals was Hortin with two, while Long, Tucker, and Colby Prather each added one. NCOE (25-1) advances to the semifinal round of play where they will take on the Smithton Cougars. This contest is set to tip at 7:15 on Tuesday, Feb. 5, at Rend Lake College.